It’s a bit of cliché to talk about “us vs. them” in organisations – the eternal conflict between sales teams and operations. Traditionally, there has not been much collaboration, respect or even contact between the 2 functions for that matter. In fact, we even have a conflict case in our training modules based on a disagreement between sales and production! For about 5 years now, Sellling Interactions has used a LEGO build exercise to introduce the benefits of process thinking and process improvements. Initially, this exercise was mainly for operational excellence work that we have been involved with. Over this time, many teams have had a go at the exercise. The record stood for 2 years at a very impressive 11 seconds, achieved by a team of nurses at Benenden Hospital in Kent. When I watched their dexterity and teamwork, I struggled to see how their time could be improved. To put it into context, the average first time build for most teams is around 4 to 7 minutes. However, earlier this year, a team of sales people from Aspire in Birmingham smashed the record, taking it down to a stunning 7 seconds. It seemed impossible: How could a team whose main work was selling in front of customers beat all those teams who spent every day looking at their operations and how to improve them? What can sales and operations learn from each other? This question prompted me to look at what contributed to their success, and what we might learn from that. There were definitely two defining factors on reflection: Creativity and competitive spirit. The team worked out a completely original way to build the car which no operations group ever found, giving them a significant time advantage upfront. Secondly, they were absolutely determined to perfect their technique. They did many practice runs, because they really wanted the fastest time. It surely helps that Aspire’s core business is physical education in schools, and many of the sales team are active sports people! Operations teams typically have very deep talents for organizing and hitting deadlines, as well as a more systems-based intellect in many cases. This helps to ensure entire factories, departments and complex processes keep running. Imagine if these qualities could be added together: The best of sales and the best of operations thinking and attitudes combined into one team of people serving customers. What could that bring in terms of competitive advantage? As markets become hyper-competitive, we need to be smart in finding new ways to improve. Customers increasingly expect service excellence, which is always a combination of commercial and operational. If lack of collaboration, communications, creativity or synergies are missing between sales and operations, this has a cost. If functional silos prevent overall improvement work, this is not good news. Fortunately, there are many consulting tools and methodologies available now to achieve such a result. A large part of our work is designing intelligent sales processes in B2B that guide high quality customer interaction and behaviour change: It is a very wise step to align sales processes with operational processes to avoid conflict and process failure. 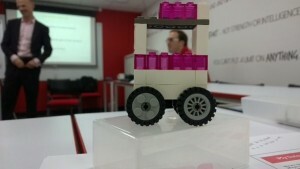 Think your organization has a team who can beat the 7 second LEGO build? Analytical, collaborative with a will to win? Contact helen.wilcox@sellinginteractions.com to arrange a sales process improvement workshop now. If you can beat that time, imagine what you could do to improve your sales and operations co-ordination!! !